The bar, a few minutes walk from Southwark station, is clearly giving more than just a nod to gardening. The tables are decorated with pots of herbs and flowers, and the cocktail menu is full of quirky, herb and fruit filled drinks. It’s light, airy and a generally chilled place to hang out, which makes a change for a London bar. I opted for a Cream Tea Martini, made by blending vodka, English strawberries and double-strength earl grey tea syrup. The menu listed it as being served with mini scones, which sadly didn’t arrive. I was a tad gutted: serving mini-scones with a cocktail is a quirky idea that somehow makes afternoon drinking seem more civilised. 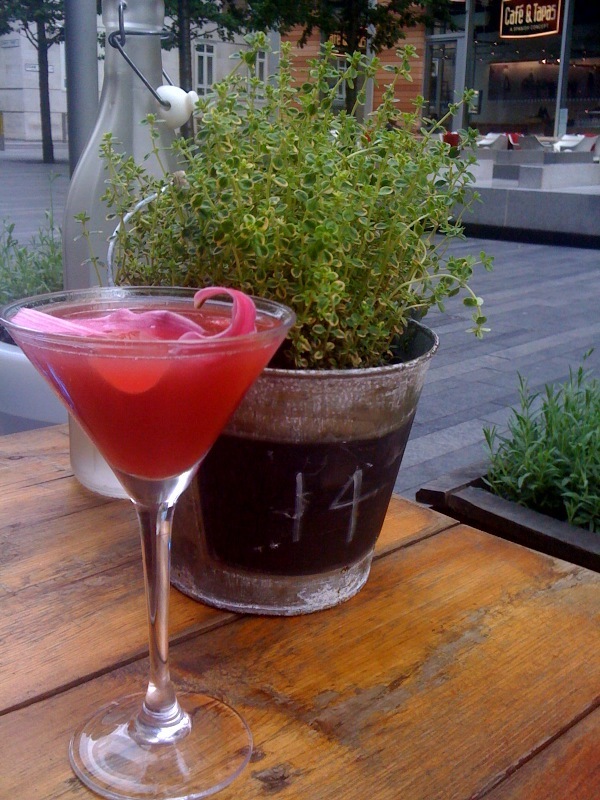 However, the cocktail was garnished with a flower petal, which gave it a decadent yet innocent look (see above pic). At £8.95, it’s a premium price, but then again, it’s a premium drink. The earl grey tea syrup gives the cocktail a gentle floral, smoky and mildly fruity flavour, thanks to the bergamot oil in the tea, blending perfectly with the vodka and strawberries. Even better, it’s easy enough to replicate at home (NB: this is my recipe rather than the official bar recipe, so any errors are my fault not The Refinery’s. But it tasted thoroughly lovely when I made it this way). Make sugar syrup with earl grey tea rather than plain water. Taste it to work out how much sugar to use (remembering that boiling sugar will burn your tongue). I tend to opt for a 1/3 to 50% sugar to water ratio but you can vary this, as long as you ensure there’s enough sugar to keep any bugs at bay (obviously not an issue if you’re making it to drink the same day). Shake with an equal measure of vodka, and ice. The end result has a hint of Turkish delight about it, and goes down ridiculously easily. It’s also a great way to turn a small handful of home-grown strawberries into a drink that will serve several friends, so is great for this time of year when the strawberries are only just starting to come through. I’m tempted to try making a variation of the Afternoon Tea martini with gin instead of vodka, as I suspect the flavours will work really well. And it’s also inspired me to consider experimenting with different tea cocktail syrups: maybe English breakfast tea syrup to add an extra twist to a Manhattan; mint tea syrup to add extra depth to Pimms and lemonade; or lapsang souchong syrup to add smoky sophistication to a Margarita. I shall be making tea syrups soon and taking them, along with an array of other exciting ingredients, to an award-winning mixologist to see what he can come up with. Watch this space. In the meantime, should you wish to make your own mini scones to go with your Afternoon Tea Martini, try using a few drops of the earl grey syrup rather than milk in the scone recipe to help the mixture bind together, so that the scones perfectly complement the cocktail. And this strawberry cookie cutter will add an extra touch of kitsch, if it’s not already too cute for words. And if you happen to live anywhere near Southwark, I’d strongly recommend a visit to The Refinery: give them a call to find out about their mixology tables – you can learn how to make cocktails for free as you drink, which saves a fortune on expensive cocktail masterclasses, should it be a skill you wish to hone. Have fun. Just been browsing your blog – some great ideas here, especially as I’ve got a friend’s housewarming party this weekend.